Collège Boréal’s Department of Continuing Education and Corporate Training provides adult learners with many training opportunities that are specifically adapted to needs of the workforce in the communities the College serves. Continuing Education is offered everywhere in Ontario and it is quick and easy to contact us. 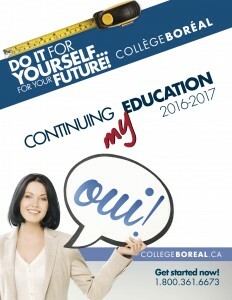 We provide our clientele with a wide array of programs, such as Accès Carrière Études (ACE – for basic training), the apprenticeship program (for trades) and various programs leading to a Boréal Certification, such as French as a Second Language (FSL), short-term programs for trades or professional training courses. Our training is accessible, diversified and flexible: we offer courses on an individual basis, online and in person! Moreover, we answer the needs of many businesses by providing customized corporate training services. Continuous skills improvement is our organization’s priority! With this in mind, we offer you accessible, diversified, flexible and recognized training that responds to the needs of the job market. Well known for quality training and a high job placement rate, our Department of Continuing Education and Corporate Training ensures that our clients’ experience surpasses their expectations.